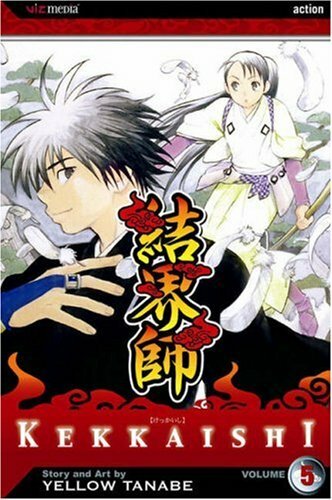 Volume 4 ends with Yoshimori deciding that he will find out how to seal off the power of the Karasumori, the valuable magical area that his and Tokine's families guard, forever. That way no one will get hurt. He spends much of volume 5 searching for information on how to do this. His first opportunity comes with the arrival of a goofy looking deity. Lord Udo is a giant sea-walrus like creature who is the deity of the Karasumori area. His bed has been destroyed and Yoshimori is sent to fix it. Lord Udo is a weird character. I guess his purpose is comic relief as much as anything. He's obsessed with food and has a naggy Jiminy Cricket-like figure who lives on top of his hat. The only benefit to the plot is Lord Udo's wealth of knowledge. Yoshimori wants to know more about the origins of the Karasumori. Yoshimori risks his life to obtain more knowledge. I like this kid more and more every day. He's incredibly selfless. Rather than thirsting for glory, he wants most to keep Tokine and others from getting hurt. Meanwhile, Tokine is going crazy. She knows that Yoshimori is up to something but he won't tell her anything. She has no idea that he's trying to seal the Karasumori, for her benefit. She thinks he's purposely trying to annoy her. The tension between them is so cute. It's obvious that they're soul mates but they're too stubborn to admit it even to themselves. The volume ends with a powerful group of demons sent to test the Karasumori. It's a battle much like all the others in this series, but it sets up an ongoing plot point of a showdown once and for all for the Karasumori site. Ok, the sea-walrus deity sounds funny and weird at the same time. I don't think I've ever encountered that before. Tokine sounds like a character that I would easily love. I'm beginning to like this series a little more with each volume. Thanks for sharing the great manga review! Sounds like a manga I would really enjoy reading! Same here, I love shonen mangas, I knew about this manga before, but I wasn't sure if I should read it or not. I also do regular book reviews and manga reviews (especially FMA, I love that series so much).